i send withdrawal request,i think i get it. I have contacted FBS Customer support and got answers to all my questions. The company serves the interests of its customers. I hope FBS would improve and develop even more. My first forex broker is FBS. So far im very happy trading with fbs. Theres a deposit bonus and fast deposit. I impressed because trading with fbs is very convenient and simple. I recommend you to trade with this broker. The company always works on improving the quality of its services. FBS is a good broker. FBS is the best broke for me.I use always this is .I want how can I get FBS visa card ….. I don’t know what is happening with [email protected] i send a message since last week and this week more than five times no response. I think FBS analytics is excellent; it does help to improve my trading strategy! The company’s services met all my requirements. I have not tried FBS analytics yet – I am used to relying on my personal experience. I have chosen FBS for the following reasons –recommendation from a relative, a friend, a colleague, etc. Dear Kingsley Monk, I am so sorry for the inconvenience. If there still will be difficulties with the downloading please contact me personally by [email protected]. I will be pleased to assist you with the downloading process. Also, could you please provide my the ticket number of your request to our Customer Support in order to check your request. If you have any question about FBS I can help you asap. Thank you very mich for your feedback. We promice to do our best to maintain this level of services and make it even better. Thank you for your feedback and for trading with us for 3 years! We really appreciate it! Probably one of the most fastest growing broker, this one is very much popular among the traders due to its various features and most importantly user friendly interference. Massive contests, good bonus on deposit, good non deposit bonus etc are all the features of this broker which makes it very much strong compared to the other brokers. Most importantly, the support system is also great and they have nice commission for IB too. Which makes it even more powerful in this trading industry. Fbs is one of the best brokers I tried that is honest and can be trusted. Very active/excellent support. Hello, I would like to say from myself about FBS. This broker is very good. Really fast evecution, all payment operations (withdrawals and deposits) are also really fast, without any delays. They add 30% to every my deposit. Also the have this insurance program. I have tried it and when i lost my insured amount they gave me it back shortly. I insure my property, why shouldn’t I insure my Forex money. This is great! And CS is also very professional and always-ready-to-help. Thank you very much for your feedback! We really appreciate your opinion! We promice never to stop improving our services. The main reason why i love this broker is the Insurance Promotion. This is fairly new promotion and that’s the most attractive one. They are always look forward to the promotions thats what i love about them. I think they are the best broker for newbies also due to their no deposit bonus of $5. Only thing that i encountered discouraging here is that the live stats of the MT4 account. In the account area, we can’t see about our live stats. Except this, they have nothing regrettable. Thank you very much for your feedback and for choosing FBS as your Forex Broker! Have a Profitable Trading with FBS! Thank you very much for your feedback! We really appreciate this. I tested this broker with 5$ bonus, I need to pay for first withdraw fee but withdraw processed really fast. The commission is charched only from trading on $5 Bonus. If a trader doesn’t want to pay this commission, he/she can not receive this bonus at all. I don’t trade with FBS on live account but participle on posting contest sponsored by them and somehow managed to win and they really give the prizes, withdraw processed really fast. 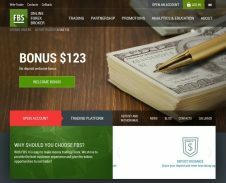 Register in our new Demo Contest “FBS Pro” – your real chance to become a Forex Professional and win real money from FBS. The $5 bonus give me a chance to trade with them. Requote happen few times but it’s not major issue. I don’t have chance to test withdraw system because I blown down my account but I think they are good broker to deal with. Thank you for your feedback. We are sorry you had no profit from the bonus trading. When you trade with your personal funds you can always insure your trading with the help of FBS Deposit Insurance system. In case of a loss FBS will pay you back.